Record high quality game videos for Mac users. Over the years, there have been lots of arguments regarding Screenflow vs Camtasia; which is really better for Mac users. It is true that users have their own point of views and preference but being more familiar with Screenflow and Camtasia can help them figure out which is better among the two. ScreenFlow, exclusively from Telestream Inc. is video editing and screencasting software for OS X operating system. 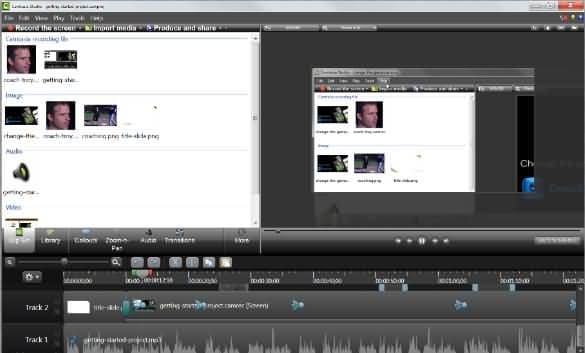 This software can capture video and audio from computers and the edit the videos that were captured and add annotation or highlights. ScreenFlow also outputs number of varied file types like GIF, AIFF, MOV, M4V and MP4. Camtasia on the other hand is an amazing video editor allowing you to make stunning videos with ease. The video and drag and drop editor assets help users complete their videos easier and faster. With Camtasia, no solid video experience is required to achieve excellent results. Part2. Why Screenflow is better? Part3. Why Camtasia is better? 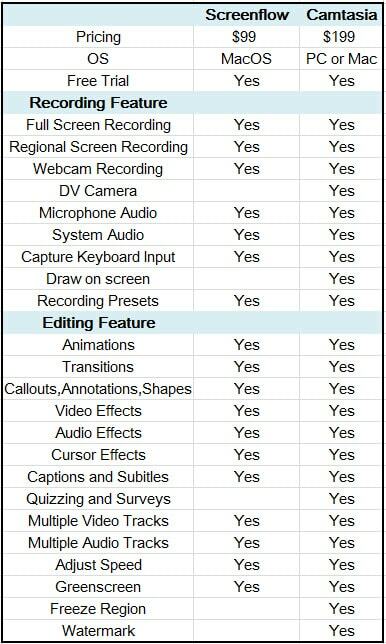 Though ScreenFlow and Camtasia are both known for their excellent performance in terms of capturing, creating and editing video, there are still sets of differences between the two. For users who are not really experts in video production, this feature is considered a good thing. In fact, many individuals have created lots of amazing videos due to its simplicity. With this software, users can experience super easy video editing and mobile phone recording. Since this got better audio and video filter, the sound effects are great. Many ScreenFlow users can attest to this. Users can easily remove background noise in just two clicks. If you want more improved audio and video, ScreenFlow is an excellent choice. This is ideal for beginners who do not have extra nice mic. Price is one of the differences between ScreenFlow and Camtasia wherein the former is half the price of Camtasia. ScreenFlow cost $99 and Camtasia cost $199. Camtasia comes with additional functions and features that ScreenFlow do not have such as interactive quizzes, speech to text caption, draw on screen. Unlike ScreenFlow, Camtasia comes with numerous online template resources that users can take advantage of. If ScreenFlow is ideal for beginners, Camtasia on the other hand is ideal for expert users. There are numerous video editing software packages and option available today so it’s quite an overwhelming and confusing to choose the perfect video editing software that suits your needs. You can expect for the best video editing software to have the most excellent features but keep in mind that features are not the only factors that need to be considered. You also need to be mindful about the cost, level of performance, efficiency and reliability of the software and many more. Camtasia is more suited for advance users and experts and since this is a bit costly, this is a good option for individuals with more budgets. Those individuals who need more annotations and callouts in videos can opt for Camtasia. They can also use this on both MAC and Windows System. ScreenFlow on the other hand is more suited for novices or beginners who need simple and easy to use software. This video editor is also especially designed for those requiring better audio but do not actually have extra mic. However, ScreenFlow only utilizes MAC system. More additional tips can help you end up with more informed buying decision. You must try both the software prior to purchasing since you only need one and you do not really have to purchase both software. Choose the one that is great enough to fulfill and satisfy your needs and requirements. Filmora Scrn is a great alternative to these two softwares. With all these given pieces of information, you now can surely decide which software is better for you.